Proven grand tour winners slated for seven-day Tirreno-Adriatico, along with opportunists who are gearing up for spring classics. 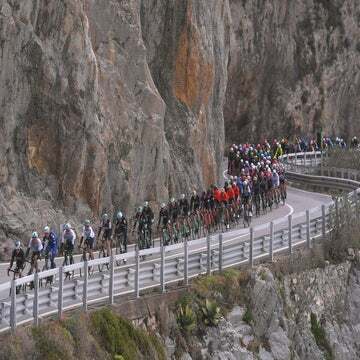 This year’s Tirreno-Adriatico route may be unconventional, but it is attracting many familiar GC stars for the 54th edition of “The Race of the Two Seas” in Italy, March 13-19. For 2019, organizers opted not to include any extended climbs, such as the Terminillo, which was the key mountaintop finish in 2017. That doesn’t seem to have scared off cycling’s top stars, as Tour de France champion Geraint Thomas (Team Sky), Vincenzo Nibali (Bahrain-Merida), and Tom Dumoulin are all confirmed to start the race Wednesday in Lido di Camaiore. Instead of uphill finishes that favor pure climbers, race organizer RCS has opted for stages that feature short, punchy climbs. Stages 2, 4, and 5 look to be the most decisive in this respect. Given the nature of those days, the race’s opening team time trial and stage 7’s 10.1km individual time trial should be crucial to deciding an overall winner. As well as grand tour winners Thomas, Nibali, and Dumoulin, Tour of Oman winner Primoz Roglic is set to lead his Jumbo-Visma team. Jakob Fuglsang has also started off his 2019 season with strong form, having won Spain’s Ruta del Sol in February, and he will lead his Astana team along with Alexey Lutsenko. Mikel Landa will be the chief of his Movistar team, given that Nairo Quintana is slated for Paris-Nice, which runs concurrently and features a more traditional route. Riders who don’t ordinarily factor into the GC conversation might also be considered for the overall trophy, a distinctive trident that pays homage to the race’s oceanic theme. Bora-Hansgrohe’s Peter Sagan will make his European debut for 2019 after winning a stage at the Santos Tour Down Under and racing Vuelta a San Juan in Argentina. Tirreno should give us an idea of how Sagan will match up with classics rival Greg Van Avermaet. The Belgian leader of Team CCC was the winner of the 2016 edition of Tirreno-Adriatico after the stage 5 mountaintop finish was canceled due to snow. In the case of both Sagan and Van Avermaet, it remains to be seen if either will have the team strength to be in the GC conversation given the route’s stage 1 TTT, which is 21.5 kilometers. 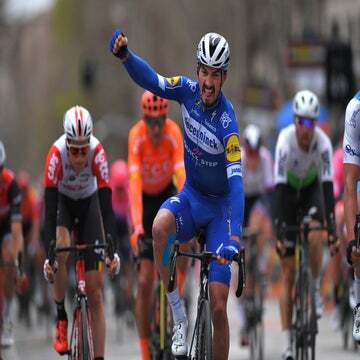 Certainly, they can be expected to vie for stage wins, along with sprinters such as Elia Viviani (Deceuninck-Quick-Step), and Fernando Gaviria (UAE Team Emirates). Last year’s winner, Michal Kwaitkowski is not slated to start Tirreno-Adriatico. Instead, Thomas and Gianni Moscon will lead Team Sky.